A discussion on bees would never be complete without including the infamous honey bee, as they have become the proverbial “canary in the coal mine”. Honeybees have perennial hives, where the thousands of bees overwinter in a cluster within, eating honey and vibrating their wings to generate heat. All bees produce a honey-like substance, but only honeybees do it in excess, as this is their food source to survive the long cold flowerless winters. The honeybee populations have been decimated in recent years from a phenomenon called “Colony Collapse Disorder”. The exact cause of this problem can’t be pin pointed to one specific cause but rather is a series of problems that have weakened the hives. 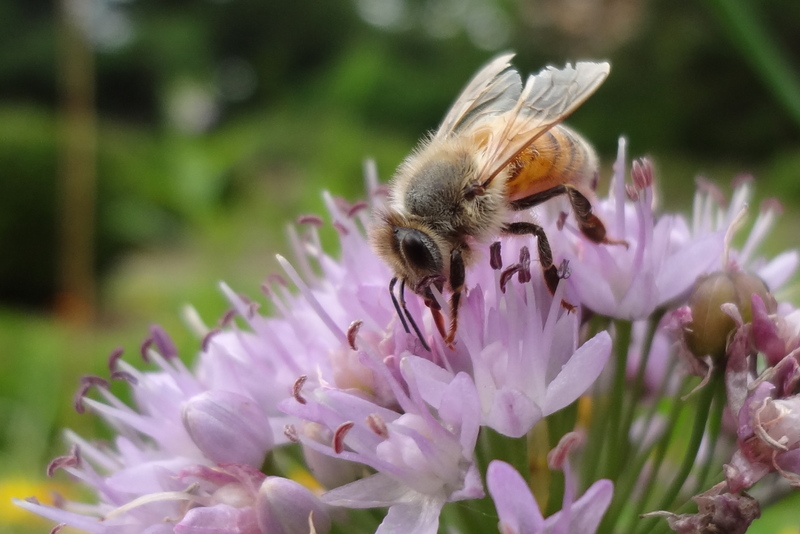 Varroa mites that live on bees and neonicotinoid’s a toxic chemical found in some insecticides are two culprits often associated with Colony Collapse Disorder. But why are people so concerned about honeybees specifically? 1) Honeybees are easily transported from farm to farm. People have been lead to believe they are essential to pollinating our crops and on large monoculture farms they are essential. Honeybees live in hives with a population up to 40,000 bees and so they are easily transported around the country to pollinate almonds in California to blueberries in Maine. American agriculture is often a monoculture of a single plant that covers hundreds of acres that all bloom at the same time. Most plants a bloom period of two to three weeks. After the bloom is over this vast monoculture, free of any diversity of plants, is a virtual desert to pollinators that a short flight radius flight of a quarter mile to just over a mile depending on their size. Without a diversity of flowering plants, the native bees simple have no habitat to survive and the honeybees are loaded onto a tractor trailer to be transported to the next blooming plant. If habitat is created to ensure biodiversity, native bees could do the work of the honey bee for free. 2) They produce honey a valuable agricultural commodity. No other bee produces honey in a quantity that can be collected and bottled.